Being diagnosed with cancer is difficult. Members of the Cancer Care team are here to help you, and your loved ones, deal with your diagnosis, treatment and follow-up care. Over 200 dedicated staff work together throughout the province to offer services to assist with your physical, social, emotional and financial needs. You and your family are essential members of your cancer care team. See Services for more detailed information. Who might I meet during my cancer journey? Cancer Patient Navigators guide you and your loved ones through the cancer care system. They can help problem solve; assist with counseling; and coordinate support care services through referrals. 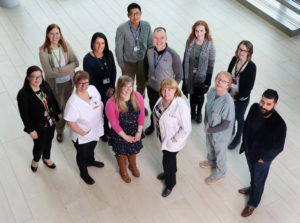 Cancer Patient Navigators are located across the province and are trained to anticipate, address and overcome barriers to care and help with timely access to services. Their job is to support you, and your family, and enable you so you can play an active role in your care. Clerical staff have many important roles in your care, including registration and booking of appointments. Clerical staff work closely with other team members to make sure everything is ready for your visit. They can be contacted for questions related to your appointments. Registered dietitians give you advice and answer questions or concerns you may have about eating, diet and health. Registered dietitians know a lot about nutrition and cancer, and they can help you manage issues that cancer and cancer treatments can have on your eating and nutrition. An oncologist is a specialist doctor who treats cancer. There are different types of cancer doctors depending on the treatment, i.e. chemotherapy (cancer medicine), radiation therapy or surgery. Additionally, there are other doctors who treat cancer such as dermatologists, endocrinologists, neurosurgeons, palliative care doctors, urologists, etc. They will talk with you about your treatment options and related risks and benefits to help make a treatment plan. Doctors can help with side effects or discomfort caused by the cancer medicine used and/or radiation therapy. Medical Oncologist: a doctor who treats cancer with chemotherapy (a cancer medicine) and other cancer-related medicines. Radiation Oncologist: a doctor who treats cancer with radiation therapy. Gynecologic Oncologist: a doctor who specializes in gynecological (female) cancers. These doctors will examine you and may suggest a biopsy (tissue sample) to help determine if you have cancer and/or what kind of cancer you have. These doctors may treat gynecological (female) cancer with chemotherapy (a cancer medicine) or perform cancer surgery if necessary. Hematology-Oncologist: a doctor that treats patients with cancer of the blood such as leukemia and lymphoma. Surgical Oncologist: a doctor who treats cancer with surgery. The surgical oncologist may also take a small sample of your lump for testing (called a biopsy). This helps determine if you have cancer and/or what kind of cancer you have. General Practitioners in Oncology: doctors that work closely with your oncologist and team to provide you with the best possible care and manage your symptoms. You may see a General Practitioner in oncology while you are receiving chemotherapy/radiation therapy. Cancer registry employees are also called cancer registrars and their job is to collect information on all cancers diagnosed in our province. Examples of information collected may be the type of cancer, location within the body, disease stage and treatment. This important information helps doctors, researchers, health providers and health-care managers to better understand the effects of cancer. Health records employees are clerical staff that ensure your health records are up-to-date and complete. They scan your medical information into your chart; type notes from doctors; and arrange for release of information as requested. Mammography technologists use a special machine to take X-rays of your breasts for cancer screening. Mammography technologists make sure the machine is safely used, and adjusted so that your X-ray images are good for the doctor to review. Cancer Care managers are experienced in cancer care, and they help to guide the rest of the cancer care team in providing high quality care to you and your family. Biomedical engineering technologists make sure radiation equipment is in good working order, and perform repairs as needed. Dosimetrists are radiation therapists with special training who help design your radiation treatment plan. They work closely with radiation oncologists, radiation therapists and medical physicists to ensure your treatment plan gives the correct amount of radiation. Medical physicists and medical physicist assistants make sure that your radiation treatment is safe and accurate. They test to ensure your radiation treatment is given as ordered by the radiation oncologist. Registered nurses (RNs) are experienced in cancer care. They are involved in all areas of your care and will be your main contact throughout your treatment and management of your illness. Nurses will provide you and your support person with information about your illness and treatment and will help coordinate support services and programs you may need to help you live with your illness. Nurses with special training in lymphedema, ostomy care and clinical trials will assist with your care if needed. A nurse practitioner has advanced nursing education. You may see her/him during treatment, in follow up or to guide you through treatment. She/he may perform a physical exam, order and interpret your tests and prescribe some of your medications. She/he can help you with any side effects or discomfort caused by cancer and its treatments. A personal care attendant can help you get to your appointments, i.e. assist you getting from the Cancer Care Centre’s main entrance, an in-patient hospital unit or the hostel to your scheduled clinic appointment, if needed. PCAs also support your care by making sure supplies, equipment and other needs are available. Personal care attendants work with other members of the team to ensure timely and complete care i.e products to and from laboratory, stores, pharmacy. Registered nurses work in Cervical and Colon Cancer Screening. They provide education about the benefits of screening. They may also explain the results of your screening test and may provide assistance in arranging follow-up care. Clinical pharmacists help you to manage your medications and any side effects you may have. Clinical pharmacists review your medications to avoid harmful drug interactions and ensure your cancer medication is given safely. Pharmacists teach you, the public and health care professionals about medications used to treat cancer. Pharmacy technicians work closely with clinical pharmacists and other cancer care team members; they can help you, and your family, access programs to assist you in getting your cancer medications. Radiation therapists plan and deliver your radiation treatment based on what your doctor has ordered. They make sure that your treatment is safe and accurate. Ask your radiation therapist questions about your treatment or related side effects. Oncology social workers have special training and experience in cancer care. They provide you with counselling and help guide you and your family during your cancer journey. They can also connect you with extra supports and resources in the community. Volunteers are found in many areas of the Provincial Cancer Care Program. They are eager to help where they can. If you are interested in volunteering with the Provincial Cancer Care Program, please visit Eastern Health’s Volunteer Resources.